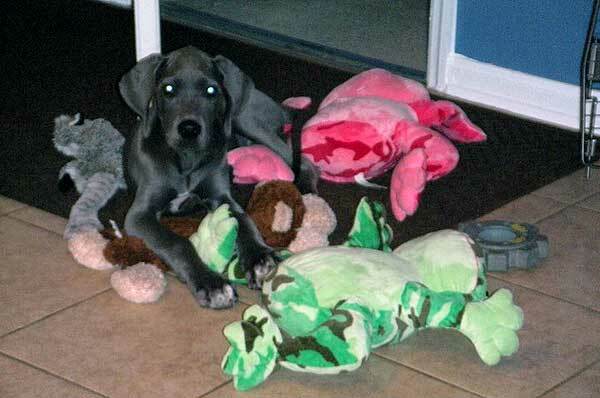 You may be questioning.. Is Great Dane puppy training really needed? We say absolutely! So you just came home with your new Great Dane puppy and you wonder.. Does this bouncing little dog with oversized paws really need puppy training? You bet he does! Your giant pawed pup will soon be out of control if left untrained. Enforcing some simple "house rules" now, will help to avoid future GIANT dog behavior problems! It all starts here. What you do now, the first few days, is critical to Great Dane puppy training success and will fortify the character of your adult dog. Congratulations on your new puppy, what a joy! Remember, your puppy is still yearning for its litter mates, may be frightened, scared and lonely. Take a day or two to simply spend time with your new pup, let them sniff, explore, and simply check-out new surroundings. Introduce him to all of your family members, pets, and creatures within your home. More than likely, the exhausted confused pup will fall asleep in your arms, tired from the new excitement. Now that your Great Dane puppy has slept and rested, it's time to introduce a brand new den. This den, actually a Puppy Crate, will soon become a favorite place for your puppy to sleep, rest in and retreat to for safety and comfort. The puppy crate crate will also help you immensely with puppy house breaking and potty training. Try to get him familiar with The Puppy Crate crate during the day! Leave the door open, throw toys and treats inside, coax him in, give him great praises and a treat when he goes inside. When your puppy is tire from play and decides to nap, put him in the crate, always in the crate for napping and sleeping. This is important! By conditioning your puppy the is a safe place to rest, sleep, and relax, he will go there often even when you and family are up and about. 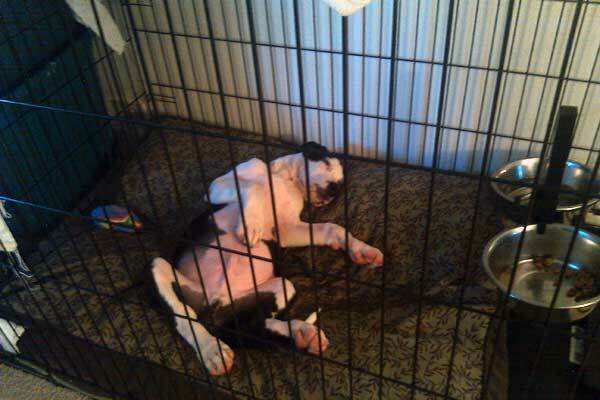 Let the kids know to leave him alone while he's in the crate, that is his safe "do not disturb" place. Okay, we're already on the right track with the puppy crate, now your baby dog has a safe place to run and go to when he is tired, scared or afraid. What comes next may be difficult, your Great Dane puppy now needs to adjust to new surroundings away from its mom, brothers and sisters. What usually happens next will be the most difficult for you and your family. I must warn you, the first few nights with Great Dane puppy training can be trying. Most all puppies in a new environment are going to whine and make noise well into the night and early morning. Being confused, afraid, with no mommy to cuddle I can't blame them. Since you took the time training your puppy to accept its new den, things should get better soon. If your dog whines at night and it probably will, you should ignore it. Don't give in to the antics, this will only condition your dog that making a ruckus will get your attention. Be sure to keep the same routine every day, especially before bedtime. This is very important, have your evening playtime, bedtime drink (not to much water), bathroom break, then off to bed, puppy crate time. If the noise starts, ignore it, I'm serious, we already know the dog's needs are met so be strong and ignore it. Sometimes a small radio or wind-up clock near the crate can calm the nervous dog. This can be frustrating so it's good practice to begin crating your Great Dane puppy away from your bedrooms. Persistence is key, most dogs will soon see Their Puppy Crate as a safe retreat and resting place. Tips for settling in: A blanket or toy from the pup's original home, similar food that it was eating back with mommy, a small radio or wind-up clock near the crate and companionship with other family dogs may help the young dog calm down. After the first few nights, the young Great Dane puppy should remain quit in its crate, any nighttime noise after that is probably a call for the bathroom. Once the dog's crate becomes his bed and "his" place within your home, the crate is going to be key to potty training your puppy. Wonderful, your Great Dane puppy is now comfortable within your home, absolutely loves his new den and is ready for puppy house breaking. A baby Dane can cause serious household damage, you should always have your eye on him when he's out and about within the home. Always enforce the House Rules and keep a watchful eye! If you can't catch and correct your Great Dane puppy in the act of bad behavior, don't bother correcting, it's too late. Your close watch is key, when you catch him in the act, this exact moment is the time for a stern "No" and redirection. Be sure to keep lots of chewy toys around. If you catch your pup chewing on a shoe or furniture, use your command and give him his toys, give lots of kind praises and love when he starts chewing his toys. Your Great Dane puppy will soon learn what he should and shouldn't do. Don't let the pup jump up on you or mouth you, this will become a problem as it gets bigger, and it will faster than you think. Correct and redirect your puppy whenever you catch him misbehaving, praise and reward him once he obeys. Remember, a puppy is only being itself, it does not mean to misbehave and actually doesn't even know how to misbehave. It's up to you from the very start to use Great Dane puppy training and teach your dog proper behavior. Don't get frustrated!, be patient and persistent, you will succeed! As your Great Dane puppy matures, you may be faced with new problems or behavior issues. We have published informative articles on Great Dane Training using correction reinforcement, as well as, Dog Clicker Training, reward and positive reinforcement methods that are helpful for a growing dog. Tip: For articles and instruction on training with a clicker, correction reinforcement and for info on dog behavior problems, visit our Training Great Danes section using our main navigation menu. For now, stick with the basics, at least for the first month or so. 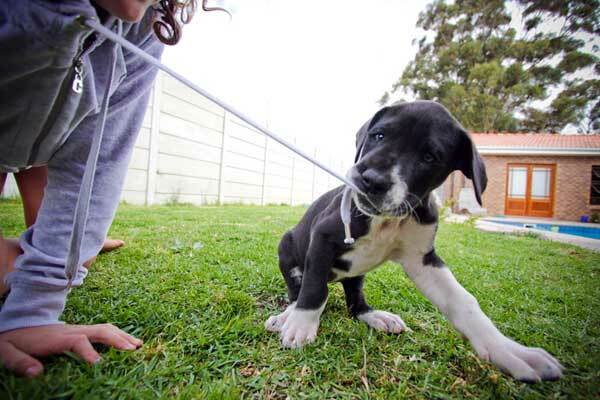 We wish you all the best, your Great Dane puppy is blessed to have found such a loving home.